I’ve been back in Spain for over a week now and it has been nice to get back into the swing of things. I didn’t realize how much I actually missed teaching my students until I went back to work on Tuesday. The kids were a lot more enthusiastic about being back than I had anticipated. And it’s always nice when a group of 11-14 year olds are super excited to see you and are asking you all sorts of questions about your holidays. The only damper on my first week back to school was my terrible jet-lag. I was on Maryland time for the vast majority of the week, which meant that I was terribly sleepy at work and wide awake when I was trying to fall asleep at night. All of that’s over now, though, and I’m back on Spain time. I have a very serious problem in that I worry/stress about absolutely everything. While I have gotten slightly better since being abroad at not sweating the small things, I really need to learn to not stress over things I have no control over. I do this even when I have nothing to worry about, I over-think so much until I find something to stress over. It’s ridiculous and needs to stop. This may seem like a silly resolution, but I have a terrible habit of staying up late for no reason. I’ll tell myself that I’ll only be on tumblr a few more minutes and the next thing I know it’s 2 a.m. This is an issue when I have to get up at 6:30 in the morning most days of the week. I have fallen asleep on public transportation more times than acceptable here in Spain. Plus, you know, sleeping a decent amount is healthy, so I should definitely try and improve that aspect of my life. In order to focus on the positive things in my life (since I have a tendency to focus on the bad…no matter how miniscule the bad may be), I am going to start a “Good Memory” calendar. This consists of writing down one good thing that happens to me every day. It can be something as small as one of my students making me laugh during class, but at least it helps me focus on the good things 🙂 Then, at the end of the year, I can look back at all the good memories I made. [Side note: This idea was not my own. 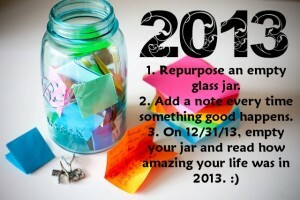 I got the idea off of tumblr (which suggests the memory jar) and a Tyler Oakley video (where he does a similar thing but with a calendar)]. 4. Focus on the NOW. This is one of my biggest resolutions for this year. I really want to focus on living in the moment. I am constantly thinking about the future and what I need to get done. And if I’m not thinking about the future, I’m reflecting on past decisions and things I would have done differently. These things impede me from living in the moment and enjoying the life I am currently living. And not living in the moment while I’m living this amazing adventure in Spain is a crime, so I am going to make a huge effort to not think about the past or future, and focus on the present. Carpe Diem after all. This past year has really sparked my love of travel. I never thought that I would be one to like to travel alone to places I have never been to, but I found that I really enjoyed my trips to Paris and London all on my lonesome. I’m planning to meet up with my friend, Emily, in Rome for Holy Week and I could not be more excited!!! It’s going to me amazing. Other than that, I really want to travel more within Spain. Spain is such an amazing country where each autonomous community is so different and has so much to offer. I really need to explore the North and South of Spain especially Cataluña, País Vasco, and Andalucía. And I definitely need to make a return trip to Paris. One long weekend in that amazing city is not enough. Well, that’s all for now. What are some of your New Year’s Resolutions? I have more, but those are a bit more personal 🙂 I’ll write more soon. Previous Home. Next Changing Beings. I love the idea of a good memory calendar! Good luck with your resolutions this year. 3,4,5 are also on my list this year. I had heard about the memory calendar a few months ago and decided I would start on my 25th birthday. I’m glad you’re enjoying your job. Do you know if you are going to renew your contract? We just got sent the email yesterday asking us if we’d like to renew. Right now, my plan is to renew. I really like how things are going with my school and the family I live with. What about you? Are you thinking of doing another year with the Ministry? Yes, I plan to renew. I’m loving my life here in Madrid right now.